Eventually, the use of this pigment was abandoned when it became generally known that people who wore clothes dyed with the substance tended to die early. To this day the French avoid making green theater costumes. 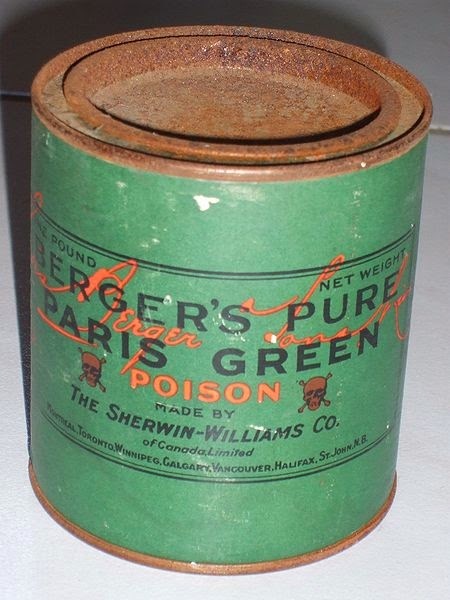 Emerald green was also used to color confectionary and cake cake decorations. In 1861, Dr W. Fraser tested wallpaper that contained arsenic.The threat, he said, came from breathing the dust of the papers, especially flocked wallpaper. The warnings went unheeded, and by 1871, arsenic production had increased to the point that Britain had become its largest producer and consumer.